Risk Assessment manage risk enterprise-wide from one central location Pro-Sapien has a number electronic risk assessment forms in their portfolio that can be implemented as stand-alone or as part of the HSEQ Innovate suite. Risk assessment forms implemented typically include 5x5 or lopo, mepo and hipo risk matrices. The various risks associated with a particular task can be quickly added to the risk assessment. Documents including photographs, PDFs and Microsoft Word files can be attached to the risk assessment. It is also possible to integrate a safe system of work into the risk assessment form - these can be printed in A4 or A5 booklet form for toolbox talks and distribution. All forms are held within SharePoint and can be searched for in various ways including data held within the form and also metadata such as when the from was completed and by whom, the approver and approval date. Established in 2012, Pro-Sapien has grown to provide award-winning, configurable Environmental, Health, Safety and Quality solutions for some of the world’s largest organizations that operate in high risk or highly regulated sectors. With years of invested pragmatic experience in all things Microsoft, Pro-sapien have become one of the industry’s most trusted solution resources for seamless, compatible compliance. Regardless of whether the form being completed is an incident report or other, chances are that there will be a number of follow up or corrective tasks as a result. Automating the action management process improves efficiency, allows for timely response and means the whole process can be reported on. All forms are held within SharePoint and can be searched for in various ways including data held within the form and also metadata such as when the form was completed and by whom, the approver and approval date, for example. Established Safe Systems of Work (SSOW) have their own library and can be easily located when planning procedures. The various risks associated with a particular task can be quickly added to the risk assessment. Documents including photographs, PDFs and Microsoft Word files can be attached to the risk assessment. It is also possible to integrate a safe system of work into the risk assessment form - these can be printed in A4 or A5 booklet form for toolbox talks and distribution. 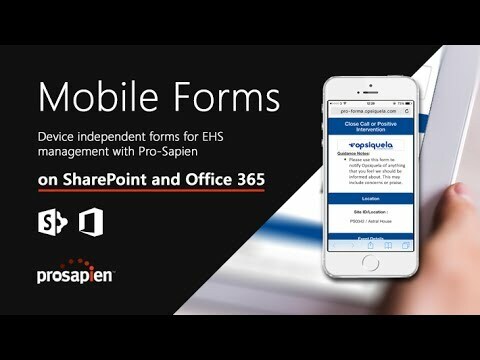 As an enterprise EHS software on SharePoint provider, we work with large organizations in high risk industries to deploy mobile forms that allow client employees to report from the field. Available alongside the majority of our modules, including hazard observations and audit and inspection, Pro-Sapien's mobile forms have won multiple awards for innovation and are currently in use across the globe.